Suzanne Desan. Reclaiming the Sacred: Lay Religion and Popular Politics in Revolutionary France. Cornell University Press, 1990. Reclaiming the Sacred examines the ways in which the new secular political culture of lay people. Focusing on the Yonne, a pro-revolutionary department in Burgundy, Suzann Desan analyzes how the region’s laity responded to the revolutionaries’ attempts to dechristianize France and to replace Christianity with new revolutionary cults. The Revolution, she shows, was a fertile and dynamic period for lay religiosity. Paradoxically, the breakdown of the institutional Church allowed the laity to seize greater initiative in defining and creating the sacred. In the absence of the clergy, lay believers transformed their religious expression and invented new rituals such as lay-led masses. Women in particular often gained new spiritual and communal power as leaders of local religious activism. Desan explores why women were usually the leaders of religious violence and illustrates how, in her view, their activism helped to stake out religion as women’s domain over the longer term. Yet her book is also about the surprisingly revolutionary means by which lay Catholics demanded the right to practice. 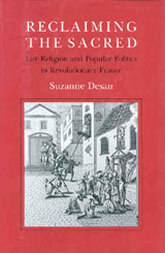 Desan challenges the traditional assumption that Catholics were necessarily counterrevolutionary by analyzing how religious activists in a republican region assimilated the rhetoric of the Revolution and fused traditional and revolutionary forms of violent collective action. Her book thus sheds light on both the popular uses of revolutionary politics and the nature of French religious practice at this critical turning point in modern history. Reclaiming the Sacred will be of interest to historians of early modern and modern Europe, especially those who work on the French Revolution, popular religion, and the history of women. Desan’s work will also be read by students of political science, and anthropology, historical sociology, and religious studies.